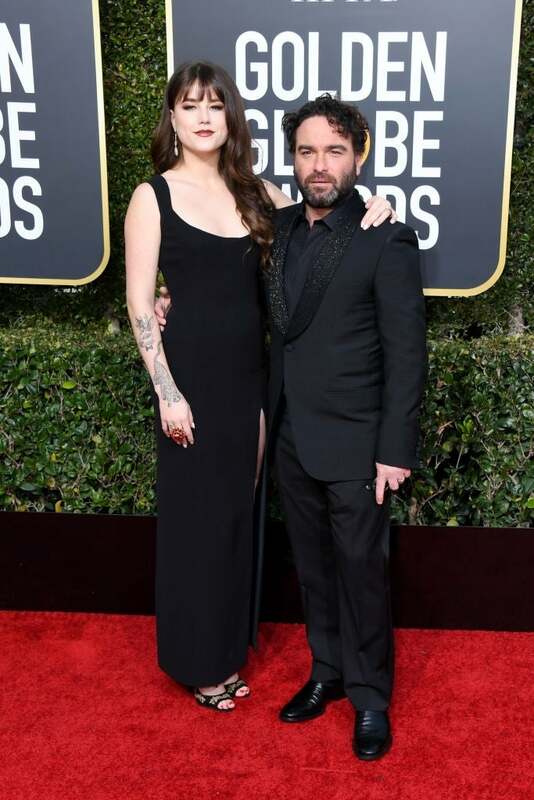 Johnny Galecki and girlfriend Alaina Meyer made a striking couple on the red carpet Sunday, making their debut as a couple at the Golden Globes. The Big Bang Theory actor, 43, and model, 21, kept things classic in all-black attire, with Galecki looking dapper in a black suit with slight detailing on the lapels and Meyer showing off her stunning pale skin and edgy tattoo in a black sheath gown. The CBS sitcom was not nominated for any Golden Globes this year, but was nominated for Best TV Series - Comedy or Musical in 2011, 2013 and 2014. Galecki himself earned a nomination for the show in 2012, while co-star Jim Parsons won a Golden Globe in 2011 for his stand-out role as Sheldon Cooper. The couple first made things public in July 2018, but appear to be quite serious, with Galecki rocking an "AMM" tattoo with a heart underneath it in honor of his lady. On New Year's Eve, the couple penned emotional notes to one another on Instagram along with photos of their adventures throughout the year. "Oh wowza, what a wonderful year it had been," Meyer wrote in the caption of her post. "One of my biggest blessings this year was falling in love with this amazing man. I’m so grateful for all of the lessons I have learned over this year and all of the memories I’ve made with family and loved ones. I loved 2018 but I am ready for 2019 and all of the magic to come. HAPPY NEW YEAR." Galecki, meanwhile wrote, "2018 wouldn’t have been half the year it was had I not met this beautiful and wonderful woman. Thank you for being all you are, darlin." The couple even sparked engagement rumors last month after sharing photos on social media featuring them both wearing rings on their left ring finger. Meyer, however, shot down speculation from the start, including in the caption the hashtag "not married." Prior to his relationship with Meyer, Galecki previously dated his Big Bang Theory on-screen wife, Kaley Cuoco, from 2008 to 2010, as well as actress Kelli Garner from March 2012 to August 2014. Cuoco, meanwhile, recently tied the knot with now-husband Karl Cook in June 2018. Galecki was in attendance at the wedding, showing that they clearly have gotten over their relationship past the point of just being able to work together.